Loy Krathong is one of Thailand’s most important festivals. 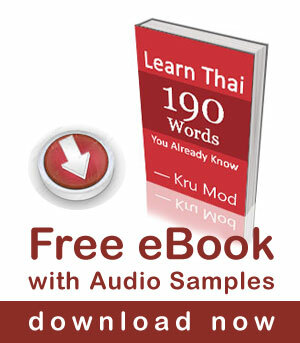 As the exact date of the holiday is determined by the Thai lunar calendar, the date is different each year. The festival normally falls in November. The festival starts in the evening when there is a full moon in the sky. Participants carry their Krathongs to the nearby rivers, canals, lake, or ponds. 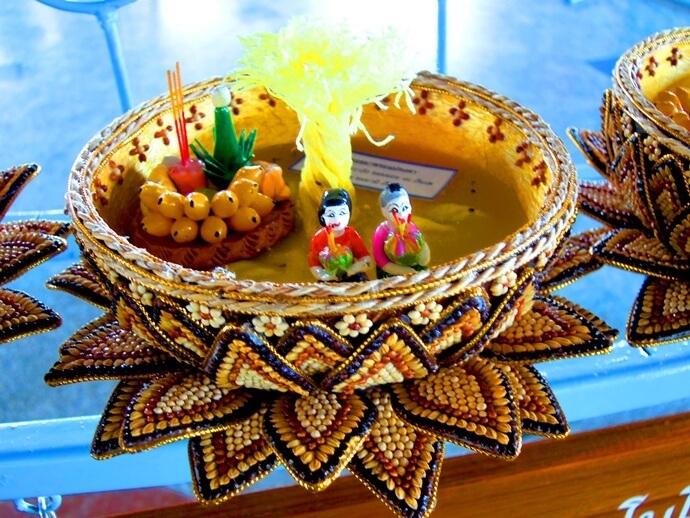 “ลอย Loy” means “float”, and a “กระทง krathong” is a special Thai floating sculpture particular to the event. 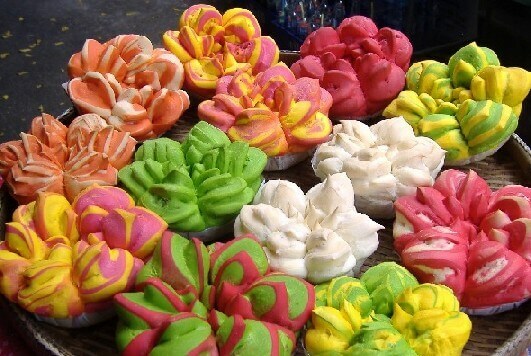 You will find hundreds of krathongs available for sell around every Loy Krathong festivity areas. After lighting candles and joss-sticks and making a wish, the Krathong is gently put on the water and let them drift away till they go out of sight. It is believed that the Krathongs carry away sins and bad luck. 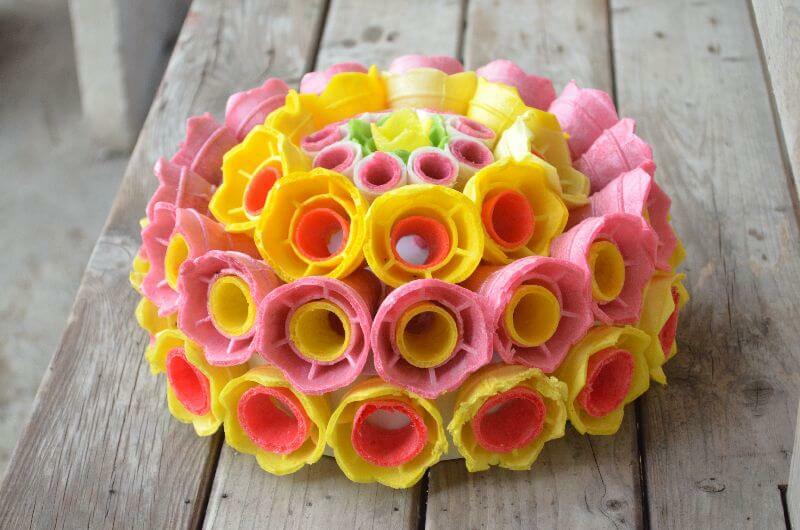 These days you will find Krathong กระทง /grà-tong/ in various shapes, sizes and it could be made from any materials. 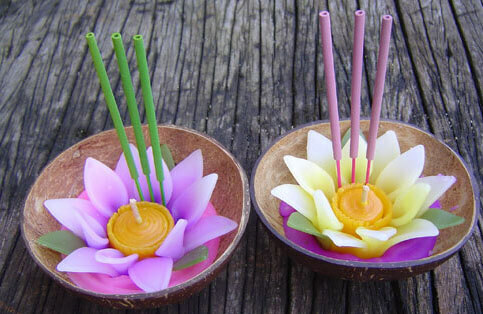 These days many Thai people have been making colorful Krathongs in a very creative way. Here are 10 types of Krathongs commonly find today. 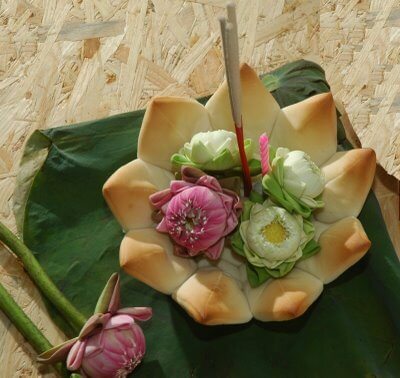 Krathongs is traditionally made from a slice of the trunk of a banana tree, then decorated with folded banana leaves which is called in Thai ‘baitong ใบตอง’ and flowers. 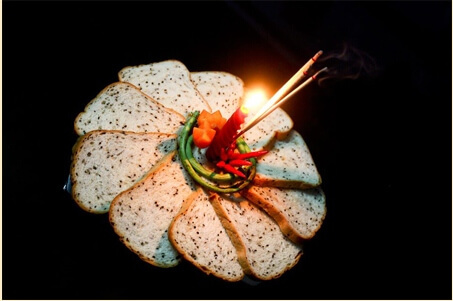 This is most beautiful and delicate Krathong in my opinion. 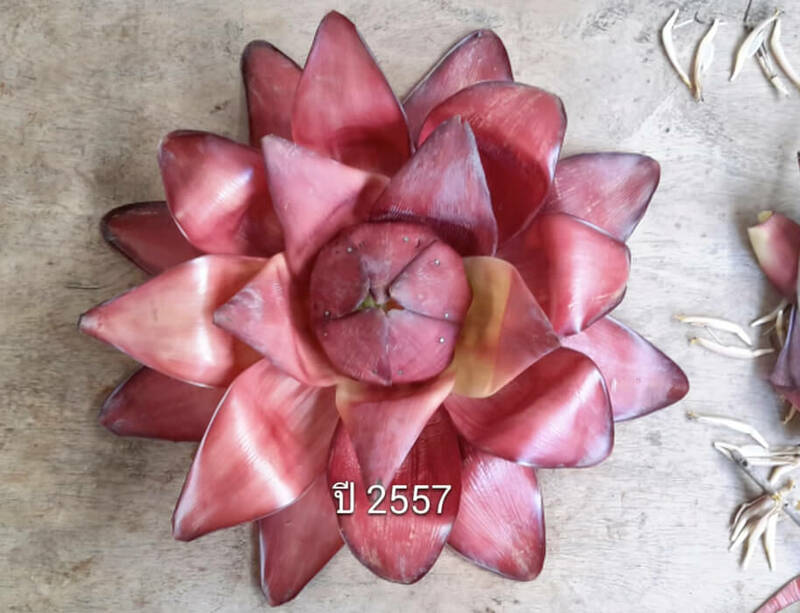 Banana Blossom or in Thai is called ‘หัวปลี /hŭa bplii/’ is not only used for cooking in Thai cuisine but they are also used to make a beautiful Krathong. Coconuts are everywhere in Thailand. 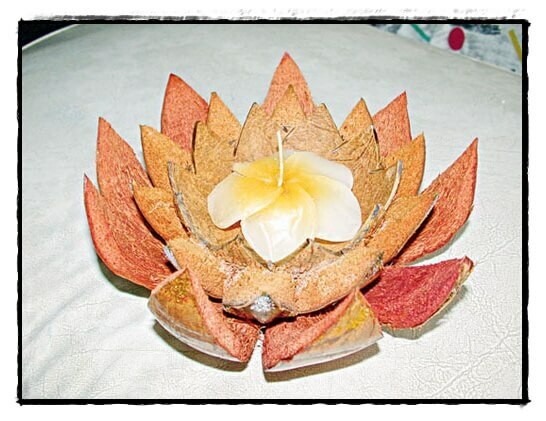 I think using coconut shell to make a beautiful Krathong is a brilliant idea. 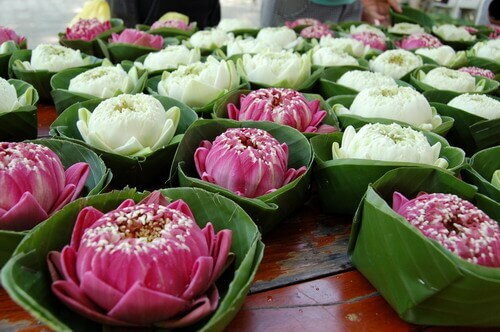 Lotus in Thai is ดอกบัว /dàwk-bua/, they are usually used for worship monk and buddha images. 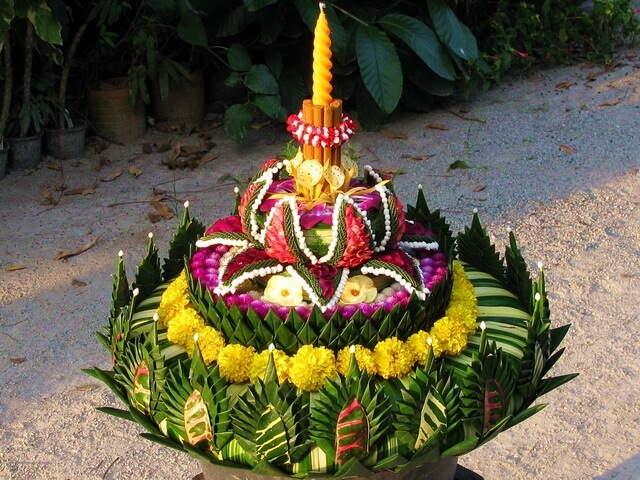 Since One purposes of the Loi Krathong festival is to ask for forgiveness from “Pra Mae Khongkha ” (The goddess of water) for any misdeeds against her , Lotus flowers are appropriate. 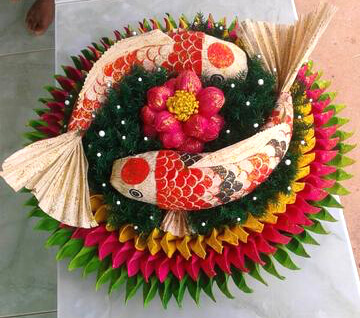 Bread Krathongs are designed to be distinguished after a few days in water or could be eaten by fish. It seems to be one of the most popular materials to use for making Krathings nowadays. 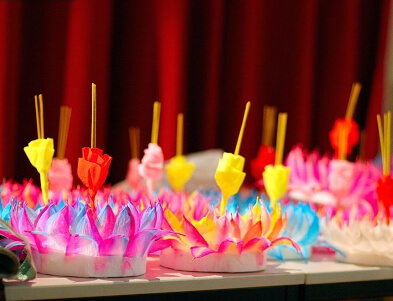 Isn’t it very creative to use ice cream cones to make a Krathong. It is colorful and fun! Corn Husk Krathongs are very popular nowadays. They can be painted colorful and made into many pretty shapes. Styrofoam Krathongs used to be widely available in Thailand but now they are banned in the country, as they pollute the rivers and take years to decompose. 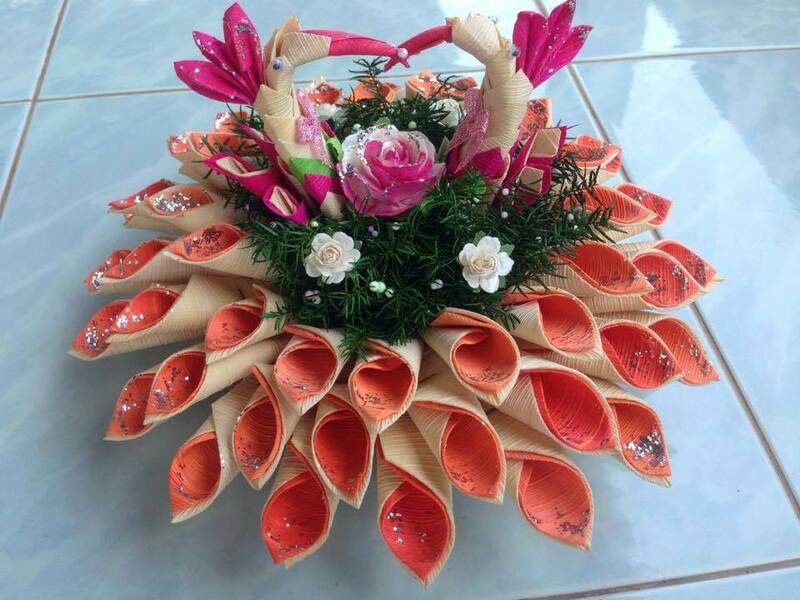 The Krathongs must be decay in order to save river. 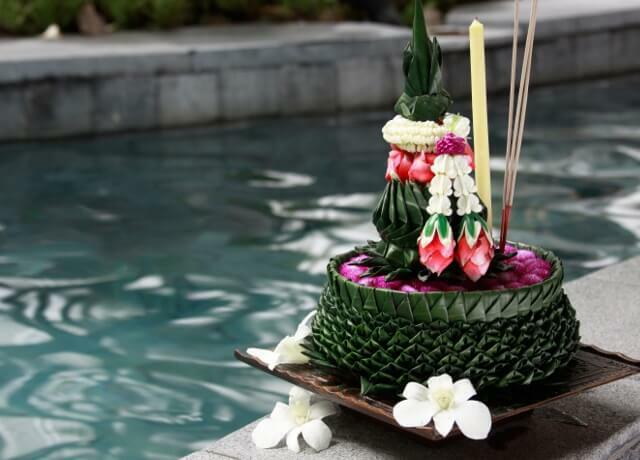 The purpose of Loi Krathong is to make merit or tumboon not by causing more problem to water environment. If you see anyone selling this type of Krathongs, please don’t support them. hope you had a happy festival or would you say a guilt free festival ? Thank you for taking the time and effort to explain it.